We are having our first “Trunk Show” at Aphrodite. If all goes well this will be the first of many where we feature artists and designers who come on site to exhibit full collections and talk directly to you about what they do, what inspires their work and what goes into it. Our first show will be truly exceptional! It features the collaboration of two great talents; Gisele Theriault and Kate Church. Gisele makes incredible jewellery under her company name The Barbers Daughters (TBDS). Her work is worn by celebrities and has been shown in fashion magazines such as Vanity Fair where Alicia Keys declared TBDs her favourite jewellery. Kate Church makes sculptural puppetry that has been shown across the continent. At the One of a Kind Show in Toronto it caught the eye of Cirque de Soleil and she was commissioned to create a private label line under their umbrella. Kate and Gisele are longtime friends and this is their first major collaboration. Let me tell you a little more about these wonderful women. Hailing now from Mahone Bay, Kate Church is an artist of delicacy. Her work mirrors life’s experiences in an offbeat quirky method of recognition. Details embroidered with movement and grace, her figures speak of curiosity, delight, tenderness and humour. The pieces she builds somehow defy conventional interpretation. They are not dolls, nor are they formal sculptures. Kate refers to her work as “sculptural puppetry” combining the line and form of sculpture with the playful anima of puppetry. Each piece is meant to become an artful muse for those who collect them. Kate is now focusing on a new collection of Goddess Shrine boxes inspired in part by Aphrodite. Gisele Theriault was born and raised in rural Cape Breton where her father was the local barber. She describes him as her first teacher of compassion and the inspiration for her company name – The Barber’s Daughters. TBDS creates contemplative jewellery to help us get out of our head and live by our heart. The engraving of poetry, prose and prayer onto jewellery was inspired by the work of Dr. Masuro Emoto, author of Hidden Messages in Water. He displayed with his microscopic photographs that the vibration of words has a profound effect on water. As our bodies are 70% water, positive words worn on the skin reflect the same back, thus creating an amulet, a grounding agent or a vitamin to the soul. Since launching the line in 2007, Gisele has travelled far with further studies, pilgrimages and missions with charitable organizations to learn more ways to bring peace to the wearer and the world we live in. TBDS work with silver, gold, bronze, gems and love from their studio in Toronto. Their motto is “Live your inspiration.”. Aphrodite is the last stop on Gisele’s eastern tour which has encompassed exhibits at Handworks in Saint John and Frida’s in Halifax. 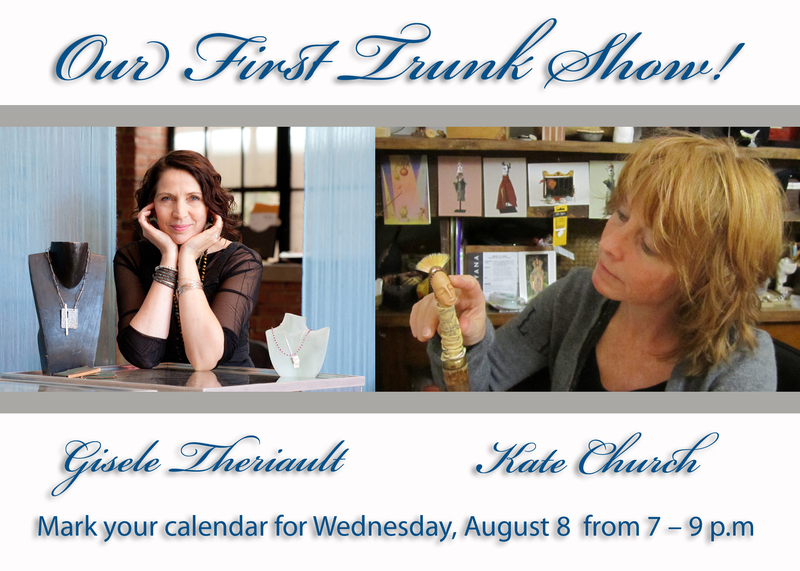 Ours is the first show that features the collaboration with Kate Church. Don’t miss this wonderful event! Please RSVP by Friday August 3. Phone 863-0606 or email tpoder@baseatlantic.ca.